The invention of social media has made it easier than ever to get your business “in the news” these days, as social media sites are taking over the conventional methods of receiving information. Think about this: compare the last time you checked Twitter to the last time you read a newspaper. Chances are that you’ve been on Twitter more recently. With this major shift in the way we access information, every business truly has the ability to create their own news channels by posting content on their individual social media accounts. Notice I said “accounts”…as in plural. That’s right! Individuals and businesses alike are now typically expected to maintain more than one social media account to stay in the know and spread their brand across the web. The big question is: which social media networks are best for my business to be using? The truth is there is no one universal social media model for every business to follow. Much like the unique nature of your brand, social media networking sites tend to attract unique audiences. The key is figuring out which social media sites offer you the best chances of connecting with your target audience. The format in which your business excels at sharing information related to your brand. After perusing through some need-to-know information about these 6 different social media sites you should have a better grasp on understanding which network is most appropriate for your business. Pinterest is the image driven social media site. Think of it as a bulletin board for “clippings” you find on the Internet. Pinterest is not an “Update Status” type of social media, but a more image-based, attention-grabbing platform to post your own blog posts, videos and other things. When an image catches your viewer’s eye, upon clicking on the image they can view the description of your pin. Clicking on the image will also take the viewer to the original location of the pin. Every pin you share will include an image pulled from the article, post, or website you’re pinning. You may also upload an image from your computer or phone. All pins include a description in which you may explain where the viewer will be taken upon clicking on your pin or attach a link. For example, when we pin our posts about the websites we’ve just taken live, the pin features the image of the website. The image is linked to the blog post from which we are pinning. If your company is not a super-blogger/video-maker Pinterest may not be the social media outlet for you. Another important factor to consider when deciding if Pinterest is a good choice for your business is who your target audience is. Pinterest is the most female dominated social media network today with females making up about 80% of the Pinterest population. If females between the ages of 35 and 54 are a primary part of your target market, Pinterest may be a rewarding domain to market your business on. 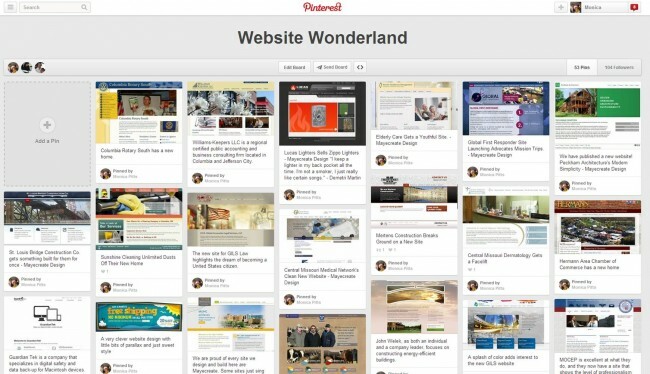 MayeCreate uses Pinterest to share some of the wonderful websites we’ve created. If you do go with Pinterest as part of your online marketing mix, make sure to always link your pins back to your website. Also, keep best practices for search engine optimization (SEO) in mind when writing titles for your boards and adding descriptions to your pins by naming them with words that people are likely to search for. This will help increase the chances of people finding your content. Facebook is probably the only social media network that practically every business has the power to utilize and benefit from. It’s one of the more universal social media sites to use in terms of accessibility and appeal, drawing in a broad demographic range of users. Even if your target market is over the age of 65, Facebook can help you reach them. As of the end of 2013, 45% of internet users 65 or older were using Facebook. It’s fairly easy to tap into niche markets and share your messages with people interested in what you have to offer on Facebook. 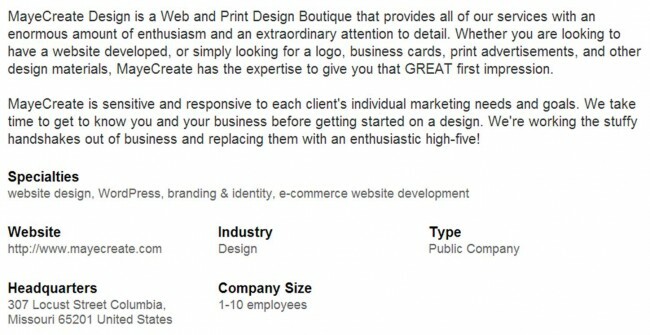 Creating a business page is free, so there’s no excuse for not having one. However, if you’re interested in advertising on Facebook or promoting your posts to reach a larger audience you’ll need to consider what sort of budget your company is willing to spend on social media. 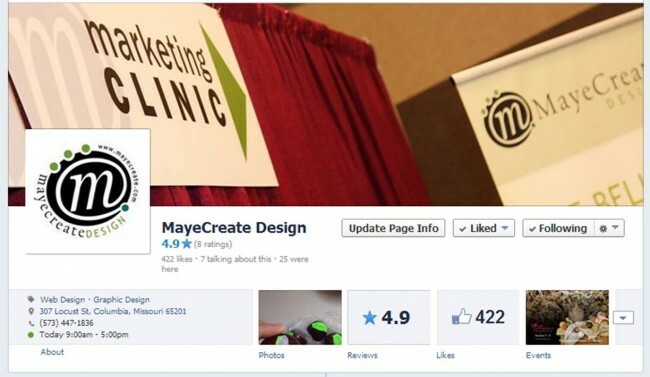 Like MayeCreate Design on Facebook! The key to a successful business Twitter account is staying active on the site and interacting with other businesses. It’s a give and take platform: if you help other businesses out by following them, mentioning them in your tweets and re-tweeting their material, they’ll probably reciprocate your generosity. Once they’re spreading your brand name around with their followers you’re on your way to growing your network. To truly reap the benefits from Twitter it can take up a collective couple hours a week, spending time reading, tweeting, searching through tweets and retweeting, if you want to see results such as increased traffic to your site or more views to your blog posts. Linking out to relevant industry news. If that type of content is what you’re hoping to share with people on a social media site then Twitter is the way to go. 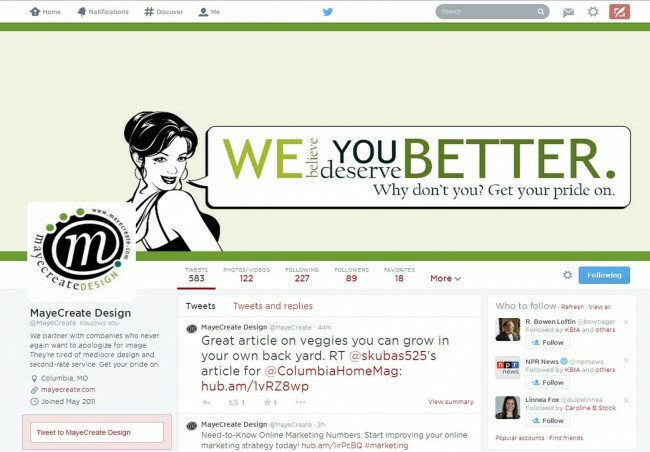 We use Twitter to send out alerts about new blog posts and to interact with other businesses. LinkedIn attracts a distinct demographic in comparison to other social media sites, important information to know when deciding which sites you want your business on. This is a more professional networking platform with a majority of members having a college degree or higher and earning $75,000 or more per year. LinkedIn is a great choice for B2B companies looking to build relationships and earn new customers by sharing more serious, informative content. At the same time, this site also acts as a resume pool so it’s great for hiring and networking purposes. Think about your social media goal. LinkedIn is geared toward networking with other business professionals. It’s not so great for selling products and services. On our LinkedIn page we provide a little snippet of information telling people about our company, some of our specialties and of course a link to our website. One of the coolest things about Google+ is the Hangout feature. If you’re looking for a social media networking site that allows your business to conduct live video conference calls with up to 10 people then you might want to consider getting your company on Google+. Creating a Google+ business page can also help your SEO. When your page is optimized correctly it may show up in search engine results when people search for your brand keywords. So, if one of your primary goals for using social media is to receive search ranking benefits, choosing Google+ can get you there. 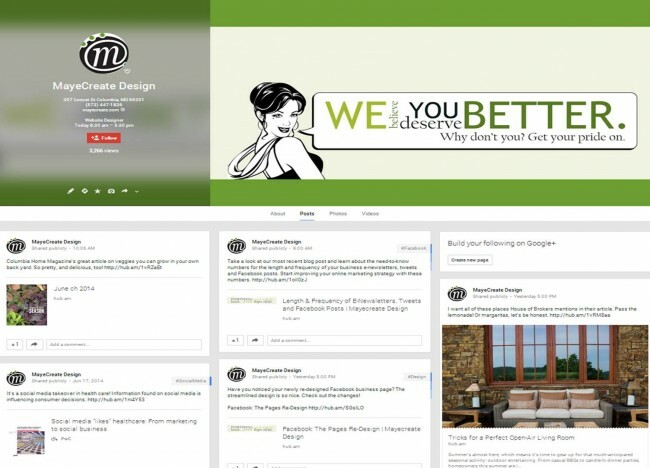 You can also connect with MayeCreate Design on Google+ and receive updates about new blog posts. Like Pinterest, YouTube is also a visually driven site but with videos as the main offering. If producing videos isn’t your forte then YouTube probably isn’t the social media site for you. However, don’t be discouraged from using YouTube as a marketing platform for your brand just because you don’t have a wicked awesome production studio or the most recent video editing software. You can record yourself in your office if you want to! The purpose of using this social media site as a business is to create and share valuable videos containing useful information. So even if you can’t produce the highest quality videos in terms of imagery, as long as you’re putting content out there that people can benefit from you’re using the site appropriately. Consider answering industry specific questions in your videos. If you know how to answer questions that people are commonly searching for, record yourself answering them and put it on your company YouTube page. Of course, creating a video that goes viral is the dream of any business, but don’t be disappointed if your videos don’t rack up as many views as, say, The Sneezing Baby Panda. Even if some of your target audience members are viewing your material, consider your videos a success. Remember you’re an expert at what you do, so sharing what you know on video is a great way to help other people out and build your own credibility. One last tidbit to remember if you do decide to use YouTube, keep your videos short and sweet. Shorter videos tend to perform better; the fact that online audiences have short attention spans is inevitable. 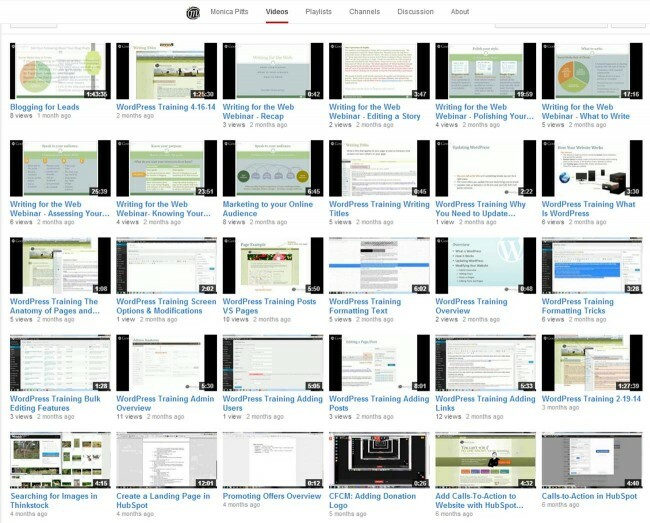 We post training videos and webinars on the MayeCreate YouTube channel to help people with blogging, website development, marketing and more. Here at MayeCreate Design we use all 6 of these social media sites, but remember: not every business needs to. If the network environment calls for content you are proficient to provide, and that content is geared toward your target audience, you’ll know you’ve found the right social media network for your business.